Donna Tartt’s latest masterpiece truly haunts. Its one of those rare pieces of fiction that not just touches but yanks a chord and one can never be the same after traversing through it’s literary riches. It’s my first book of Ms Tartt and I must say she makes it to the list of my favorite authors and this book makes it to one of the best books that I have ever read. I am definitely not surprised that it both won the Pulitzer this year and stayed firmly nailed to the best-seller charts since when it was published. If art is what balms your soul in an otherwise dreary life, this tome of fiction is art. Just perfect. Just as Theodore Decker is introduced to the reader comes the first twist, a fateful bombing of the Metropolitan Museum of Art in New York City which takes his mother away from the 13-year old Theo. With that his adventure starts, moving to Vegas, the Dickinson life of a young lad, cruel fate, unrequited love, a little dog, subtle doses of mirth, realistic happenings, honesty and characters like no other. And his fragile life is tied to Fabritius’s master-piece, The Goldfinch. Art theft, terrorism and finally philosophy. The book ends with a serious dose of philosophy so simply explained, that nonchalantly puts up pertinent questions and cajoles you to think, to really really think. And before you know it, youre in love with the prose. Like great art, its beauty lies in the eyes of its beholder. I won’t force my opinion down your throat nor will I prod you to read it. But if you do read you may love it or hate it, but you can simply not ignore it or be non-pulsed by it. Here’s an extract from the book, it is out of context here, probably better appreciated when put in the context of the book, but its great writing anyway. “I look at the blanked-out faces of the other passengers–hoisting their briefcases, their backpacks, shuffling to disembark–and I think of what Hobie said: beauty alters the grain of reality. And I keep thinking too of the more conventional wisdom: namely, that the pursuit of pure beauty is a trap, a fast track to bitterness and sorrow, that beauty has to be wedded to something more meaningful. Only what is that thing? Why am I made the way I am? Why do I care about all the wrong things, and nothing at all for the right ones? Or, to tip it another way: how can I see so clearly that everything I love or care about is illusion, and yet–for me, anyway–all that’s worth living for lies in that charm? Maybe it’s because of New York, maybe its because of art, maybe its the racy narrative, maybe its the gripping plot, maybe the literary genius (I had to fetch the dictionary almost at every other turn of the page! ), maybe the sheer beauty of prose, maybe the starkness of emotion, the novel had me hanging on to every word. P.S. 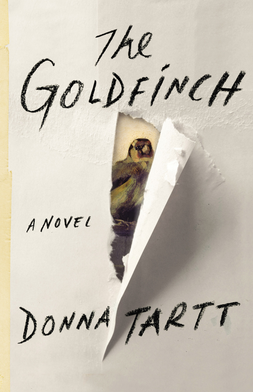 It is a hyperbole I know but five-hundred stars is what I would rate Donna Tartt’s ‘The Goldfinch’.